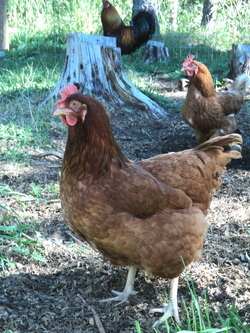 This is a Rhode Island Red hen. In March she hatched five chicks. They were Goldilocks, Sunny, and Henny Loonie. There were also two rooster chicks (called cockerels). This is our chicken Teddy and her chicks, called Ginger and Snowy. This is a Brown Leghorn. 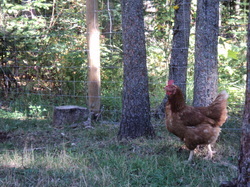 Our chickens always are outside for the whole day. 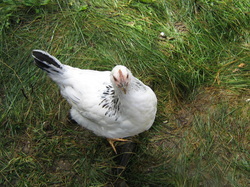 This is Toeless, and she is a Columbian Rock pullet (young hen). She is missing a toenail, and that's why we called her Toeless.